We are located 4.5 hours north east of Vancouver along the Trans Canada Hiway #1 in BC's southern interior, and about 1 hour west of Kamloops. 1. Venables Valley Road North, entrance with pull-off rest area. 2. 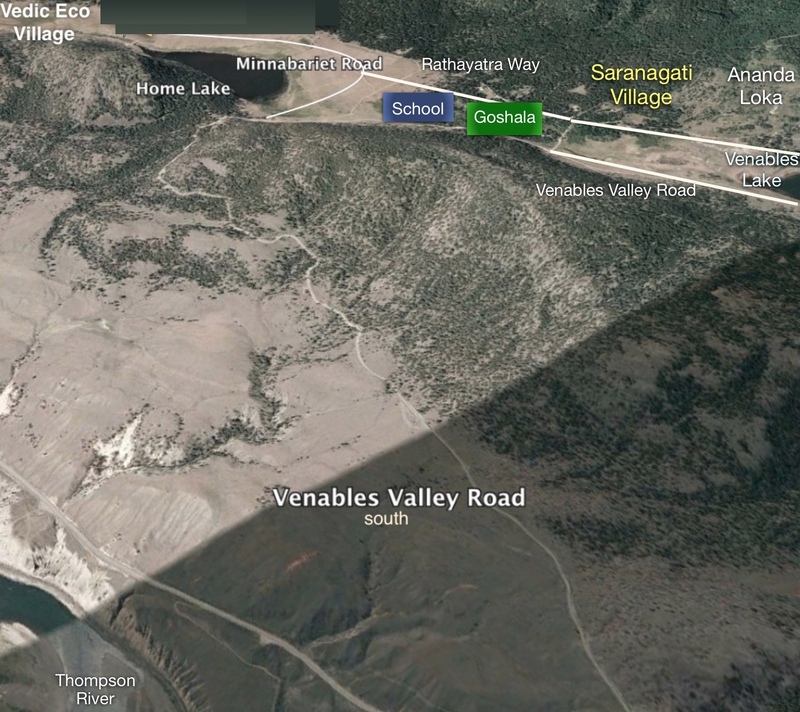 Venables Valley Road South, entrance is a partially paved road entrance, a couple kilometers away from the north entrance. 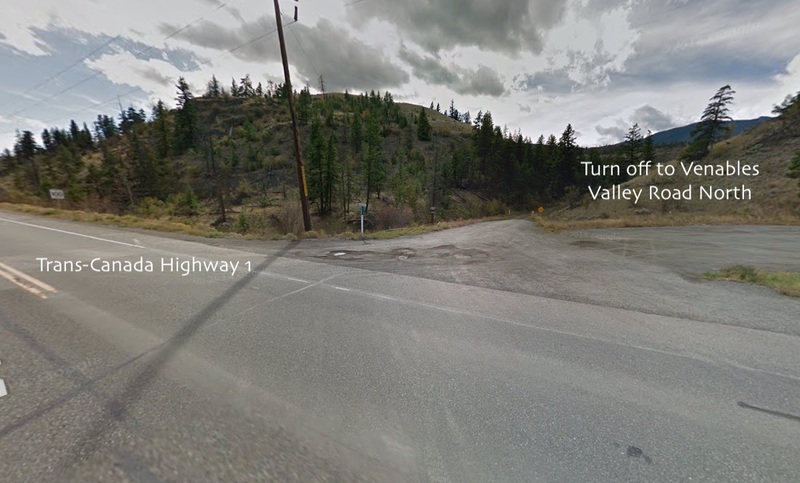 Coming from the North on Highway 1, turn right at the first Venables Valley Road (North) about 20 km past Cache Creek. Drive up the road for about 5 km until you come to the fork. Turn left at the fork, you're in Saranagati, continue for a few kms and you will start to see homes. If you continue past the fork and take the first driveway on the left you will end up at Bhumi Farms, part of the Saranagati project. Drive up Trans-Canada Hwy (BC-1) about 4 or 5 hours from Vancouver. About 20 minutes after Spences Bridge turn left at Venables Valley Road South, there is a large green highway sign announcing the road. Drive up for about 5 minutes when you descend into the valley take the very first left onto Minnabariet Road. You will see fields and a lake on your left as you enter the valley. Turn right onto Rathayatra way and drive for a few hundred meters. The Goshala is on your right side, just past the school. 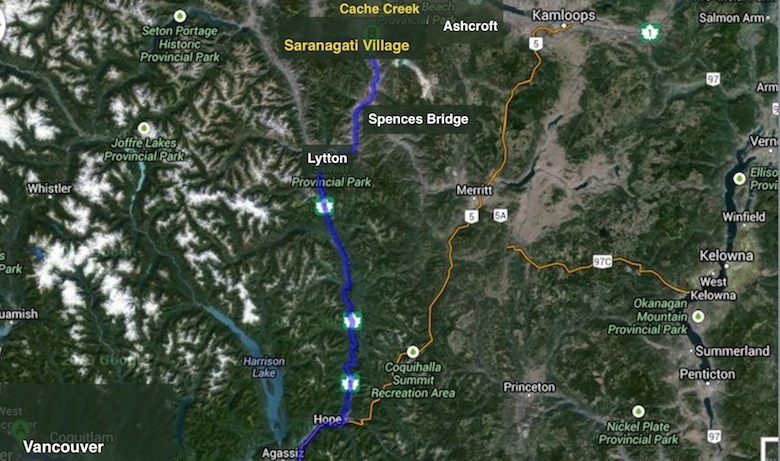 Please Note: While the mailing address of Saranagati Village shows as located in Ashcroft BC, the street address on Venables Valley Road shows as located in Spences Bridge, BC on Google Maps.